It’s a driving school like no other, with myriad obstacles and moving hazards that also happen to be alive. There are the bicycle boys, wobbling along, finding their balance in the same vacant stretch of red dirt where drivers learn to shift and motorcyclists learn to ride. Balls sail at multiple informal soccer matches, while dogs scuttle and children meander. The driving school isflanked by a busy road. Avoid that. Steer well clear of the huge oily pond, gray with trash, on the other side. And watch for the ruts left after the rains have eaten away at the ground. It all seems a bit much for Bilyaminu Saminu, who sits behind the wheel of a black Honda Civic sedan for the first time as instructor Muhammad Sabiu takes five minutes in a calm, almost hypnotic voice to explain the basics. Ignition. Clutch. Gas. Brake. Then he tells Saminu to start it up. The car jolts forward, shimmying over the undulating ground. Driving slowly, Saminu avoids a soccer player, a bicycle and three boys walking by. Good thing Sabiu, the instructor, isn’t an impatient man. He coaches his student in a muted drone, occasionally correcting the wheel when his pupil goes astray. He started instructing at 17, shortly after he learned to drive. A fellow driving teacher began at 14. The instructors are all from a nearby neighborhood in Kano, Nigeria’s second largest city, and saw the entrepreneurial potential to turn a vacant block popular with footballers into an informal driving school. Nigerian traffic is not for the faint of heart. Pounding on the horn and shouting at traffic is de rigueur. Yellow auto rickshaws buzz thickly, changing lanes abruptly, dodging trucks and cars. Beggars and hawkers on footweave between the traffic. Trucks burp black smoke like impolite drunks before lurching without warning into your lane. Outside the cities, goats and cows amble across highways, and trucks, loaded perilously high, bear signs warning drivers to “Horn before passing.” Drivers catapult through villages at high speed, horns blaring, operating on the logic that the faster you drive, the more gasoline you save. Saminu, a 22-year-old student, seems slightly nervous. He keeps taking his eyes off the scene in front, and turns his head toward Sabiu. The teacher constantly gestures with his hand, as though bouncing an invisible ball, telling Saminu to slow down. 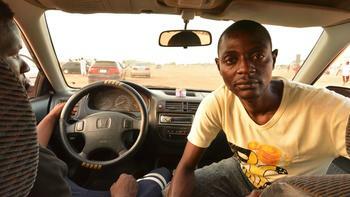 Saminu isstudying mass communications but knows many unemployed graduates, and his uncle promised to give him a car to become an “inter-city driver,” sort of a taxi driver here, if he learned to drive. Kano does have formal driving schools, but they are expensive. For Saminu, and for him, the open, red field was the cheapest option. He changes gear and the car jerks forward. “Why is it jerking?” asks Saminu, eyes fixed intently on Sabiu. Two footballers dash in front of the car. The car jerks again. Suddenly a soccer match seems to have exploded around the car, with players dashing everywhere. “Just go on at this slow pace. Second gear is OK. When you’re turning, put on the indicator,” Sabiu says blithely. Over the years, Sabiu has found that the timid are hard to teach, and his remarks about women drivers reflect this city’s sexist culture. Two years ago, a footballer ecstatic that his team had won threw himself exuberantly to the ground in front of Sabiu’s car during a lesson. “Before we could stop, we just ran over his leg and broke his leg,” Sabiu recalls. Women drivers, not so long ago unheard of in northern Nigeria, are increasingly taking to the roads, but strict cultural mores can make student-teacher relations difficult. “Some instructors find it difficult to just touch her hand if they have to or grab the steering and be a bit rough and just pull her foot off the accelerator if she’s going too fast. You need to break through that barrier, even if you shout at her,” he says. Once, a man sent his wife with his personal driver to the field to learn, with her baby in the back seat. But the personal driver refused to entrust her to the driving school, and took on the task himself. “She slammed her foot on the gas pedal. She plunged into that pond. The car went to the bottom,” Sabiu said, gesturing to the murky trash-filled water. Onlookers dived into the pond to save the baby, the woman and the would-be driving instructor. But Sabiu’s worst driver ever turned up a few months back: the guy overflowing with confidence. “He had too much ego,” Sabiu says. “He would not listen to my commands. He just took the wheel and wanted to drive at high speed. “The guy was rough and reckless. He went into the ruts. He would not slow down when someone was crossing in front of the car. He was swerving everywhere. He just couldn’t control the car; I was even afraid he’d go into the pond. But drivers too timid or reckless are not the only hazard. After Sabiu saved up for six years to buy a Honda Civic 2000, he took on a student who offered him a biscuit that turned out to be laced with drugs. The student drove him out of town, dumped him and stole the car. There is no such drama today as Sabiu continues to calmly guide his latest pupil. Saminu trundles safely by the pond, clearly thrilled to have mastered driving so easily. Driving will mean being able to cruise the city and hang out with his friends. Independence. He turns to Sabiu, his eyes bright with exhilaration. Saminu comes around the final curve as Sabiu explains how to stop. He lurches to a halt, behind three cars. “How do you reverse?” he repeats, eagerly. “When do you shift into fifth gear?” He couldn’t wait for his next lesson.